wildlife | Live more lovely. Good News, Hoop Injuries, and Bobcats? Oh My! Tomorrow is my trip to Texas, and I’m incredibly excited! I’ve been staying so busy all week getting everything in order. I finished making a huge batch of eye pillows for the yoga studio (a task I had been procrastinating on, since I volunteered LAST Thursday), and dropped them off this morning. I stayed for the hatha class, and it was just what I needed to help me slow down & be here now. Things are coming together, and tomorrow morning, come 9:10, I’ll be in the air & on my way to hug my dad for the first time in a year! There are a few things worth mentioning, but please forgive me for the lack of order in this post. My thoughts are kind of everywhere! First, I owe you all a Riley update. Riley is ALIVE! I’m spinning in my mind and just so happy to type that Riley is doing fine. He had to have an emergency surgery on his leg to repair some torn tendons, but his bone wasn’t fractured. He stayed over night at the emergency clinic, and then went to a specialist Wednesday morning and stayed there last night. My step dad says he’s going home today, so I’m feeling a lot better. I’m so thankful that it wasn’t more serious. I still can’t believe that the person didn’t stop to help him or attempt to let us know. I could never do that. Once, on a first date with a boy I didn’t know, I hit a raccoon. We had only been in the car with one another for 10 minutes, MAYBE. It’s the only time I’ve ever hit an animal, and it destroyed me. I instantly burst into tears (we’re talking snot face tears), and turned around to see if I could help it, but it was gone. The guy said “Seriously? It’s just an animal.” and that was the end of our date. Seriously. There are two kinds of people in this world: the ones with HEART, who realize no life is less important than another, and the heartless, who have a lot to learn. I feel so lucky that Riley survived this horrible incident. Like any car VS. dog situation, the chances weren’t in his favor, but somehow he made it. Please consider what an awful experience being struck by a vehicle is for any creature & pay attention when you’re driving. Accidents happen to everyone, but just please be aware and drive accordingly for their sakes. 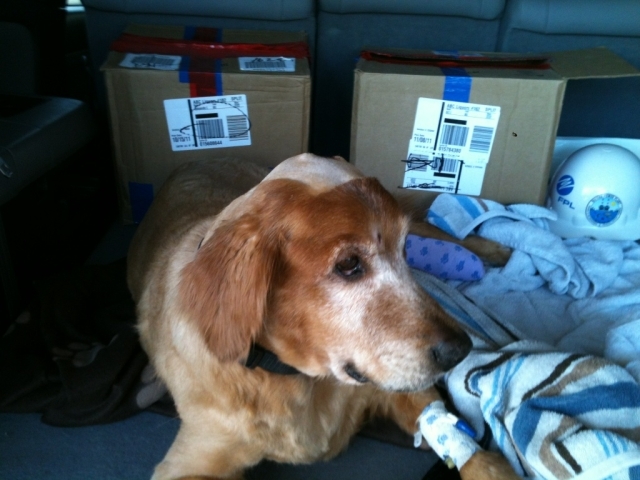 My step dad took this picture on their way from the ER to the other vet, poor bald boy! We’re so lucky! In other critter related news, I saw a bobcat on my property this morning! It was much darker than any I’ve previously seen and looked to be about 40 pounds. This was the best look I’ve ever had at one in the wild, and it was pretty awesome. I love living in the woods & having such wild neighbors! Again, sorry that this post is scattered. I could take the time to make it ‘flow’, but I think it’s more important to work on de-scattering myself first! My plane leaves in less than 24 hours! Woo hoo!